On the morning of Wednesday, September 12, 1979, preparations were underway along the Central Gulf Coast for extremely dangerous Hurricane Frederic. At 5 a.m. CDT, the hurricane was 250 miles southeast of New Orleans with top winds of 130mph. Frederic was approaching category four status. The central pressure as measured by Air Force reconnaissance was 948 millibars. Intensification had leveled off, but some slight strengthening was expected during the day. In fact, a 943 millibars central pressure measurement would be recorded at 6:57 a.m.
SPLASH model runs (used for predicting storm surge heights) indicated a storm surge of 11.5 feet for a 940 millibar storm moving north northwest at 11 knots making landfall just west of Mobile Bay. Advisories warned that there would be a 10-15 foot storm surge near and up to fifty miles east of the center at landfall. Interestingly, SPLASH runs indicated that the same storm making landfall just east of New Orleans would have resulted in a maximum storm surge of 19 feet at Bay St. Louis, Mississippi. The storm was moving northwest at 12 mph, but was still expected to make a turn to a more northerly course. I can remember listening to WWL early that morning and hearing Norman Robinette say that the turn had already begun. In fact, WWL television meteorologist Nash Roberts would get in hot water with the National Weather Service. Roberts had gone on the air the night before and told residents of New Orleans not to prepare since the hurricane was going to turn. This was in direct contradiction to advice being issued by the local NWS office in New Orleans. During the day, a total of 350,000 people evacuated low lying areas along the Gulf Coast from Louisiana to Northwest Florida. Memories of Hurricane Camille were still fresh in the minds of Mississippians, who heeded the evacuation advices of local officials. Local statements from the NWS Mobile were very specific with evacuation advices for coastal Alabama and Mississippi, stating that the preparations should be completed by noon. 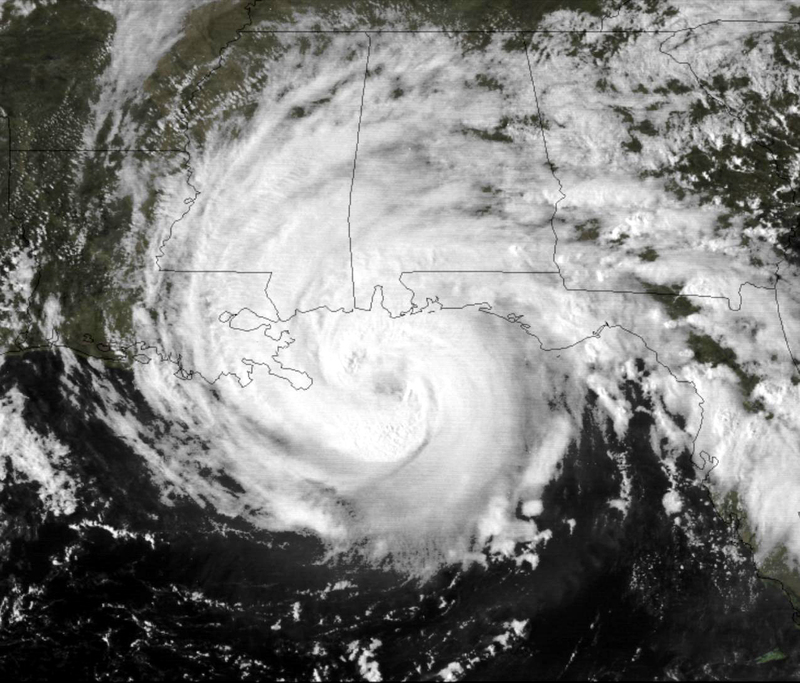 Frederic made the expected slight turn to the north northwest, making landfall at about 10 p.m. CDT, passing over Dauphin Island and crossed the coastline near the Alabama/Mississippi border. A wind gust of 145 miles per hour was measured on equipment atop the Dauphin Island Bridge. The bridge was destroyed. A wind gust of 139 mph was measured at the Dauphin Island Sea Lab before the equipment failed. A storm surge of 12 feet was observed in Gulf Shores. Nearly all structures within 200 yards of the Alabama coast were destroyed. There were only two fatalities as a direct result of Frederic. Total damages were 2.3 billion dollars, making Frederic the most expensive hurricane ever to strike the United States up to that point.